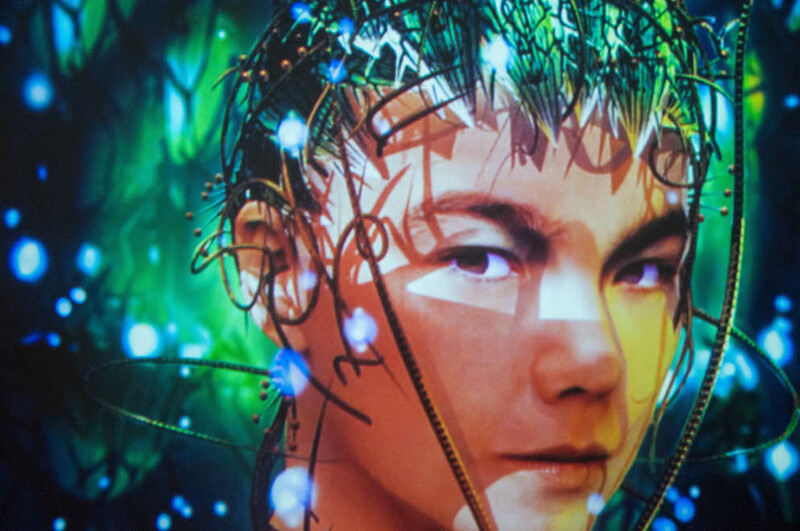 Last week, the much-hyped Björk retrospective (simply titled Björk) opened at New York’s Museum of Modern Art. By now, you have probably read the reviews, most of which are negative. While the show is not without flaws, its mere existence is evidence of changes within the mainstream art world in that it is a major show of a female, non-American artist presented in an untraditional manor. Taste is subjective, and if the opportunity arises to visit the exhibition, you absolutely should, because—at the very least—it is a glorious glimpse into the work of one of the most influential artists of our time. Conversely, Björk represents the difficulties an institution faces when presenting a show with an expectedly large draw. Museum visitors are greeted in the lobby by several instruments used in Björk’s Biophilia project, which is also the first app in the MoMA collection. These instruments—a gameleste, pipe organ, gravity harp, and Tesla coil—plink and plunk quietly on their own. At 9am on a Saturday, they filled the space with eclectic elevator music, but it is difficult to imagine them having a presence in the typically packed lobby. The museum advises guests to first visit the third floor and grab a timed ticket for “Songlines”, the closest thing the retrospective offers to a career timeline. It is recommended to wait for your ticketed time by visiting the “Black Lake” screening and music video theater on the second floor. Chances are that visitors will spend their time before “Songlines” waiting in a line. At the very least, it is a glorious glimpse into the work of one of the most influential artists of our time. Which brings us to the already infamous lines. They are a serious flaw, but they are also unavoidable based on the odd placement and labyrinthian design of the exhibition (not to mention Björk’s immense popularity). Rather than using the sixth floor special exhibition galleries, the museum built a makeshift space in the atrium. As the New York Times’ Roberta Smith aptly said, “The museum has certainly given more space to less.” Indeed, MoMA’s choice to host a huge retrospective in such small quarters seems shortsighted. Why not use the much larger MoMA PS1? Curator Klaus Biesenbach regularly presents exhibitions by big-name artists in spaces that work with their content, but why was this not the case with Björk? Simply put, Björk deserves more. The narrative, a loosely autobiographical version of the artist’s life written by Icelandic poet Sjón, is full of majestic metaphors and abstract anecdotes. While this audio experience could be quite enjoyable with closed eyes, the combination of attempting to grasp the words playing in your head, the music layered beneath those words, the words on the pages in front of you, the details of the costumes, and fellow visitors, is disorienting. At some point, you must decide what element of the experience you want to absorb the most: the visuals or the story playing in your head. It is commendable if you can do both. “Songlines” is divided into “chambers,” each representing one of Björk’s eight albums. While this initially sounds promising, seeing as each period of Björk’s career is a carefully curated world, the result is many rooms and very few objects. While each journal and outfit deserves to be closely examined, there is very little time or space to spend with the objects. While the rest of your time group huddles around the red sneakers from the “Hyperballad” video or the Alexander McQueen bell dress, it is easy to become distracted by the audio or feel shuffled along by other visitors. That being said, the objects on display are beautiful, such as the Hussein Calayan designed paper jacket from the Post cover, the “All Is Full of Love” robots, and of course, the swan dress. By the end of “Songlines” the novice Björk’s fan will not walk away with too much new knowledge. The wall panels offer very little context about the objects on display other than date and designer. While there is a vague sense of progression, there are very few hard facts about Björk’s career or the significance of the objects being shown. This is an artistic choice, and in many ways, it was a wise choice to not add another sensory element into the already overwhelming exhibition. The MoMA’s attempt to make the exhibition an immersive experience is admirable, but the lack of information makes Björk feels incomplete. “Black Lake” is perhaps the exhibition’s highlight, and says more about Björk in ten minutes than in however long it takes to wade through “Songlines”. The centerpiece of Vulnicura, “Black Lake” is a reflection on her relationship with artist Matthew Barney. The video, commissioned by MoMA and directed by Andrew Thomas Huang, finds Björk exorcising her pain in a cave until she finally emerges into Iceland’s green expanse healed, or at least purged (a quick flashback to a line from “Pluto”: “Excuse me but I’ll have to explode this body off me”). She beats her chest and drags herself over rocks on a journey to reclaim herself. Visitors watch the video in a cave of their own, a soundproofed space adorned with 6,000 felt cones. In this small room, surrounded by strangers, “Black Lake” offers each viewer a deeply personal, deeply human experience. (“Did I love you too much?”) Pain is uniting, pain is personal, and few others can express it as well as Björk.